The Hispanic Society of America, which owns this painting, has a web site here. The Duchess in this portrait is thirty-five. Her husband had died the year before, and she is dressed in mourning attire. On the ground, written in the soil is "solo Goya" (or: Goya Alone). On her fingers are two rings, one saying "Alba" and the one pointing at the inscription in the dirt "Goya." The inscription had originally been covered, but during a cleaning of the painting during the 20th century, the words became seen. The painting stayed in Goya's personal possession until his death. Whether the image was not accepted by the Duchess, and thus stayed with Goya, or if he rather chose to keep it himself, either through change of mind or some other reason, is unknown. 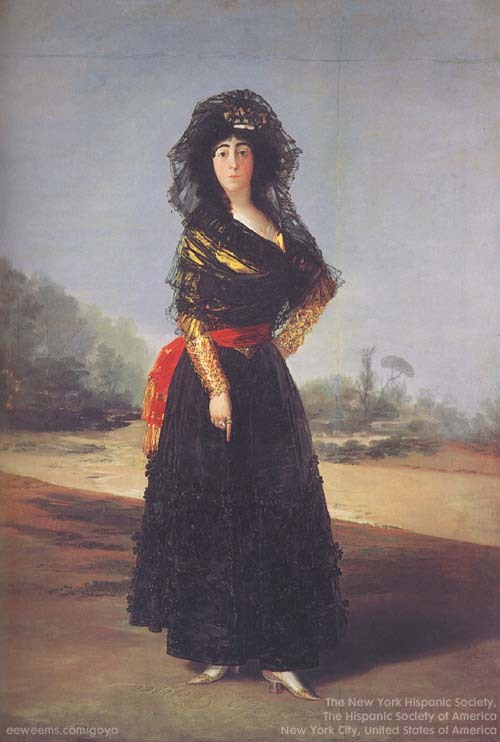 This painting is sometimes used as evidence of the supposed intimate nature of the relationship she and Goya held; however, Goya commanded the skills to produce a portrait of the duchess without her even modeling for it. Dr. Sarah Symmons has an audio podcast file of a lecture about the Duchess of Alba here.